HTC has released its VR headset iPhone companion app on the App Store, enabling HTC Vive owners to receive real-world notifications from their phone while immersed in virtual reality. The HTC Vive app brings some of the headset's unique features to iPhone owners for the first time, such as the ability to receive calls, text messages, and calendar reminders within the relative isolation of immersive VR. Notifications forwarded by the app appear momentarily in the headset's HUD, and remain available in the HTC Vive dashboard for later perusal. Third-party app notifications are not currently supported. In addition to downloading the free app, headset owners must install the HTC Vive client on their PC. 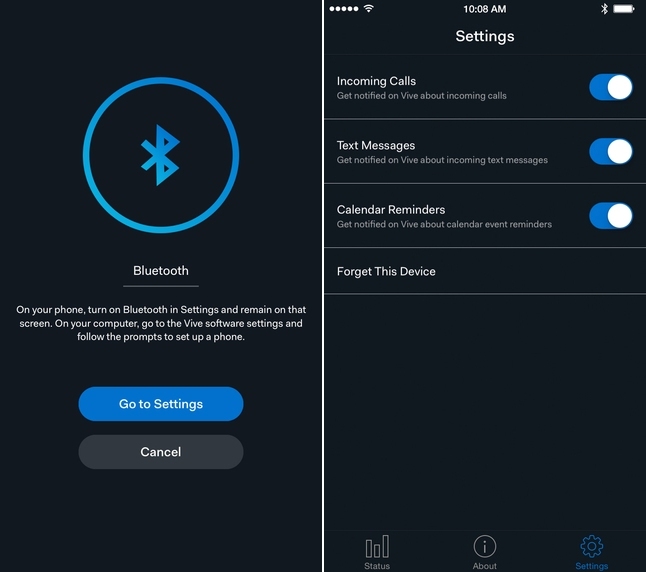 At present, the Android app's facility to send preset responses to calls or texts from within the virtual world is not supported in the iOS version. VR is going to be so great in a few years. Lower barriers to entry, killer apps, better software. Exciting times ahead. Good to see this from HTC. Also supported AirPlay on their latest flagship phone. The FPS thing is true—but oversimplified by many. It matters for some game types more than others, and "magic numbers" thrown out are somewhat arbitrary. A game where your body holds still is VERY different needs from a game in a vehicle vs (worst-case) a walking game. Likewise, the speed of the action, the need (or not) to turn suddenly, etc. all impact what kind of framerate is truly needed. Again, that's why low-cost phone-based VR (when done right) works decently: GPU power is a piece of the puzzle, but it's simply not the the whole story. It is oversimplified, and you're right, low-end VR like what's been done with phone GPUs is fun to play around with. But when most people are talking about something being VR ready, they're talking about games and more advanced VR such as what we're seeing on the OR and Vive, and that's simply not going to happen with the current level of GPUs in any Apple product, or for the foreseeable future unless they start making performance a priority in some of their lineup. When Apple takes graphics seriously enough to put something high-end enough in their machines. This is the real answer. VR is very susceptible to framerate fluctuation, meaning that you need enough horsepower to maintain max FPS, or you run the risk of getting sick. Obviously this won't effect everyone equally, but at the end of the day, Apple is going to have to care about performance instead of thinness and make a move back to non-laptop parts in their desktop machines.